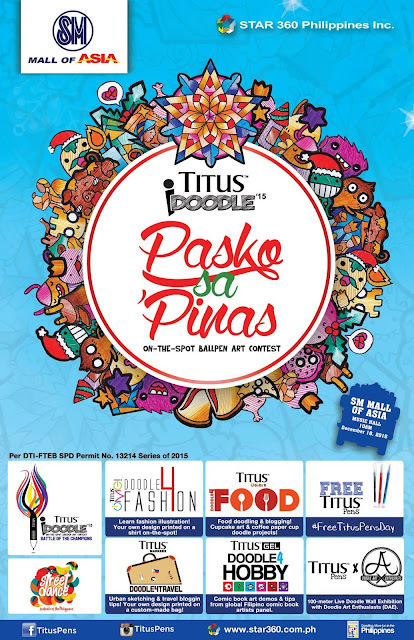 Doodle enthusiasts across the country are all set to stretch their creative muscles for Titus Pens iDoodle Battle of the Champions, a grand on-the spot ballpen art competition on December 18, 2015 at the Music Hall of SM Mall of Asia in Pasay City. On its third year, the Titus Pens iDoodle On-the-Spot Ballpen Art Contest brings “Battle of the Champions,” an assembly of 75 regional champions from Bacolod, Pampanga, Cebu, Manila, Dagupan, Iloilo, Davao, Bicol, Batangas, Cagayan de Oro, Bulacan, Cavite, Baguio, La Union and Dumaguete. The year-long competitions helped spread the word of “Visit the Philippines Year 2015,” the Department of Tourism’s campaign to attract both domestic and international visitors. “We are excited to be part of the doodling craze that promotes creativity and Philippine tourism with ballpen art. Not only are we assembling the country’s rising artists under one roof, we are also holding workshops on doodling in the areas of fashion, comics, food and travel,” said Louie Gee Empeño, Titus Pens brand manager. Empeño refers to side events “Titus OMG! Doodle4Fashion,” which will tackle fashion illustration and let participants design their own shirts; “Titus Colors Doodle4Food,” which will feature cupcake art and coffee cup doodle projects; “Titus Doodle4Travel,” which will focus on urban sketching; and “Titus Gel Doodle4Hobby,” where comic book artists will share how doodling helps them in creating fantastic superhero stories. “Anyone can discover that art is not only limited with paintbrushes or canvases. People can create masterpieces with a Titus pen on a piece of paper or even a coffee cup,” he added. Coinciding with the “Battle of the Champions” is Titus iDoodle Pasko sa Pinas On-the-Spot Ballpen Art Contest open to participants aged 10-25 years old, who made a P100-purchase of Titus Pens products at any National Bookstore branch or SM Supplies Station. Interested doodlers can register from 10 am-12 noon during the event. Up for grabs are gift packs and cash prizes up to P10,000. The event expects around 500-700 ballpen artists. Over at SM Mall of Asia Seaside Boulevard, Doodle Arts Enthusiasts will also hold a live doodling demonstration on a wall spanning 100 meters. Street dancers from the country’s colorful festivals will also perform during the grand doodling celebration.